Cost to hire an annual air conditioner maintenance service varies greatly by region (and even by zip code). Get free estimates from air-conditioning and heating contractors in your city. Cost to hire an annual air conditioner maintenance service varies greatly by region (and even by zip code). 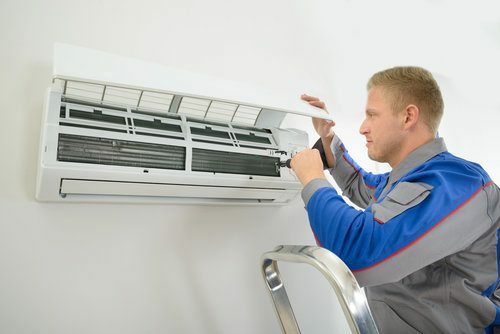 How much does it cost to hire an annual air conditioner maintenance service? Maintaining your air conditioner (HVAC) unit will ensure that it’s ready to properly cool your home all throughout the summer. Keeping your unit in good condition is also important for your wallet: lack of maintenance shortens a unit’s lifespan by 10-15 years, meaning you’ll need to buy a new one sooner. Lack of maintenance also results in a 5% efficiency loss, which results in higher energy bills. For this discussion, we will consider the costs of maintaining an air conditioning unit annually. A flat fee for a one-time maintenance visit costs $70 - $100 and an annual maintenance contract will cost $150. You should have your air conditioning maintenance done at least once a year, in the spring. Doing it in the spring will allow your technician to repair any damage the unit might have acquired during the winter, and make it ready just in time for the arrival of warmer temperatures. However, it’s best to do maintenance twice a year: in the spring and fall. Sticking to this bi-annual schedule will keep your unit running optimally. Many HVAC maintenance companies offer annual servicing contracts for preventative maintenance. Such contracts cost anywhere from $100-$150 per year, and cover annual visits in which standard maintenance tasks are performed. Some companies will allow you to make monthly payments for your maintenance contract, and will provide you with discounts around 15% if you hire them when you need your unit repaired. Getting a contract will usually give you more warranty coverage than if you just paid for a single maintenance visit: if anything is wrong with your unit between maintenance visits, your HVAC technician will come and address the issue. Air conditioning units work by using evaporator and condenser coils to remove heat from the air in your home. Warm household air blows through the evaporator coils, which transfer the heat into refrigerant vapor, which is then moved to the condenser in the outdoor part of the unit. The condenser coils turn the now-warm refrigerant vapor into liquid, allowing the heat to be dispersed outside and away from your home. Both evaporator and condenser coils are integral to the function of your air conditioner, and must be properly maintained in order for the unit to work. Replacement of air filters: dirty filters can lower your unit’s efficiency and cause damage. You can perform monthly checks and cleanings yourself. If your AC is in constant use, you’ll need to replace the filters once per month to keep the unit running properly. Filters typically cost $15-$60. Some filters are reusable, and only need regular cleaning. Clean evaporator and condenser coils: if the coils are caked with debris, they can’t remove the heat from your home’s air as well. Badly damaged coils may need to be replaced. Replacing evaporator coils can cost $230-$400. Replacement condenser coils can cost as much as $500-$750. Remove surrounding debris: any fallen leaves or greenery that has grown too close to the unit should be cleared and trimmed. Comb coil fins: combing coil fins restores their original form, removing blockage-causing bends and make it easier to release warm air. Clean clogged drains: clogged drains can cause fluid in your unit to accumulate, leading to humidity and water damage in your home. Lubricate moving parts: lubrication will reduce friction and the amount of electricity needed for your unit to normally function. Tighten electrical connections: loose connections can be hazardous and cause your system to malfunction. They can also reduce your unit’s longevity. Thermostat settings: the thermostat should be set for the unit to come on when it’s too warm in your home, and be off when it reaches a comfortable temperature. If your thermostat isn’t accurately programmed, it can lead to discomfort and high energy consumption. Refrigerant level: if your refrigerant level is low or there’s a leak, your unit can’t properly cool. Replacing refrigerant costs less than $100, but is often included in your maintenance fee. If there’s a leak that needs repair, the cost can be $300-$1000. Seal between air conditioner and window frame: a gap here can cause warm air to get into your home and cool air to escape. Capacitors: if your capacitors aren’t working, your unit might not start properly. Compressor: some HVAC problems may at first seem to be caused by a faulty compressor. Having your compressor checked can confirm whether or not it’s the cause of an issue. Electrical connections: faulty connections can cause certain parts to not work, or your unit to not start at all. HVAC technicians generally charge $50-$70 per hour. A single maintenance visit takes 1-2 hours ($50-$140). Flat fees for maintenance service visits range around $70-$100. In the fall you should prepare your HVAC unit for winter. Turn off your air conditioner’s circuit, then hose it off to remove debris. It must dry completely. Do this when it’s warm enough that there’s no risk of the water freezing. Cover the exposed pipes with foam pipe insulation ($1-$3), and protect your entire unit with a weatherproof cover ($20-$50). You can keep your HVAC unit running well in between maintenance visits by doing your own upkeep. Simple upkeep tasks include keeping the filters and coils clear of debris, keeping surrounding greenery trimmed, and checking the seals and ducts. Performing regular checks can alert you to problems before the annual maintenance visit. If your AC unit is working fine, but a technician is suggesting expensive repairs, get a second opinion. We recommend getting the advice of more than one technician before committing to a costly repair. Annual maintenance contracts usually provide more extensive guarantees and warranties than you’d get if you paid for a one-time maintenance service visit. Many companies have separate warranties for equipment and labor: parts are usually covered for 1 year, while the labor to replace parts/make repairs can often be covered for 5 to 10 years. Professional HVAC technicians should be licensed. Check whether your service provider has a legal HVAC technician license and EPA 608 certification. Excellence and NATE certifications aren’t required, but do verify a technician’s expertise. How much does it cost to hire an annual air conditioner maintenance service in my city? Cost to hire an annual air conditioner maintenance service varies greatly by region (and even by zip code). To get free estimates from local contractors, please indicate yours.